Flavius Zeno (c. 425 -491 ) (Ζήνων), original name Tarasicodissa or Trascalissaeus, Eastern Roman Emperor (February 9, 474 - April 9, 491) was one of the more prominent of the early Byzantine emperors. Domestic revolts and religious dissension plagued his reign which nevertheless succeeded to some extent in foreign issues. He presided over the official end of the Roman Empire in the west under Julius Nepos and Romulus Augustus, while at the same time contributing much to stabilizing the empire in the east. He was thus the first emperor of the eastern Roman empire to rule without a western counterpart, making him the first emperor of a fully independent Byzantine Empire. Tarasicodissa, as he was known as a young man, was an Isaurian tribesman from the region now known as Armenia. The Isaurians are thought to be ancestors of the modern Kurds, and were looked upon as barbarians by the Romans even though they had been Roman citizens for more than two centuries. Still, a fortuitous turn of events ultimately placed Zeno on the throne in Constantinople. Well-known as a warrior, Tarasicodissa caught the eye of the Emperor Leo I in the mid-460s, when Leo was searching for alternatives to using increasingly unreliable Germanic and Alan mercenaries in his army. In 466, Tarasicodissa exposed the treachery of Ardabur, the son of the Alans eastern magister militum Aspar and made himself even more indispensable. By 468, when Leo's incompetent (and perhaps traitorous) generals led the Byzantine fleet to disaster in a campaign against the Vandals, Tarasicodissa was considered Leo's best general. While on a campaign in Thrace he narrowly escaped assassination instigated by Aspar. On Tarasicodissa's return to the capital, Aspar was killed on Leo's orders and Tarasicodissa became magister militum in his own right. To make himself more acceptable to the Roman hierarchy and the native Greek population of Constantinople, Tarasicodissa adopted the Greek name of Zeno and used it for the rest of his life after his marriage to Leo's daughter Ariadne in 468. Although designed by Leo to secure the Isaurian support against the aforementioned ambitious minister Aspar, this political arrangement brought them a son, who was to become the emperor Leo II upon the death of his grandfather in 473. In the meantime, Zeno continued to lead the eastern armies with a great deal of success, most notably in expelling the Vandals from Epirus, which they invaded in 469 as part of King Geiseric's revenge for being attacked a year earlier. He also led troops against incursions by the Huns and Gepids south of the Danube River. Since Leo II was too young to rule himself, Ariadne and her mother Verina prevailed upon Leo to crown Zeno as co-emperor, which he did on February 9, 474. When Leo became ill and died on November 17, Zeno became sole emperor. Restored to rule of the entire empire, Zeno was within two months forced to make a momentous decision when Odoacer deposed the last emperor in the west and asked for Zeno's recognition as a patrician officer of Zeno's court, intending to rule without an emperor. 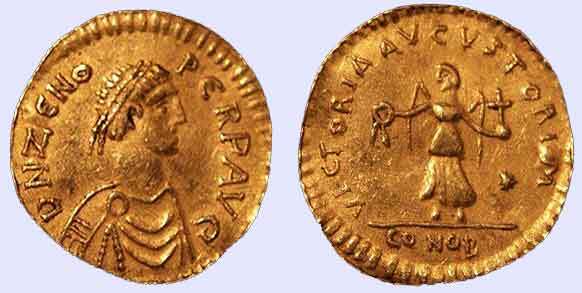 Zeno granted this, and thus in theory became the first emperor of a united Roman Empire since 395. In reality, he all but wrote off the west until several years later, when Odoacer began to violate the terms of his agreement with Zeno. At the same time, Zeno sent a mission to Carthage with the intent of making a permanent peace settlement with Geiseric, who was still making constant raids on eastern cities and merchant shipping. By recognizing Geiseric as an independent king and with the full extent of his conquests, Zeno was able to hammer out a peace which ended the Vandal attacks in the east, brought freedom of religion to the Catholics under Vandal rule, and lasted for more than 50 years. Since 472 the aggressions of the two Ostrogoth leaders, Theodoric the Great, son of Theodemir, and Theodoric Strabo, had been a constant source of danger. Though Zeno at times contrived to play them off against each other, they in turn were able to profit by his dynastic rivalries, and it was only by offering them pay and high command that he kept them from attacking Constantinople itself. Zeno survived another revolt in 478, when his mother-in-law Verina attempted to kill Illus for turning against Basiliscus, her brother. The revolt was led by her son-in-law Marcian and the Ostrogoth warlord Theoderic Strabo, but Illus again proved his loyalty to Zeno by quashing the revolt. However, Illus and Zeno had a falling out by 484, and once again Zeno had to put down a bloody revolt in the east. After Theodoric Strabo died in 481, the future Theodoric became king of the entire Ostrogothic nation and began to be a source of trouble in the Balkan peninsula. Zeno got rid of the problem in 487 by inducing him to invade Italy to fight Odoacer and establish his new kingdom there, all but eliminating the German presence in the east. He died on April 9, 491, after ruling for 17 years and 2 months. Because he and Ariadne had no other children, his widow chose a favored member of the imperial court, Anastasius, to succeed him. Zeno is described as a lax and indolent ruler, but he seems to have husbanded the resources of the empire so as to leave it appreciably stronger at his death. In ecclesiastical history, Zeno is associated with the Henoticon or "instrument of union", promulgated by him and signed by all the Eastern bishops, with the design of solving the monophysite controversy. A compostion of Agathias of Myrine describes Zeno playing tabula, a sort of backgammon. ^ Austin, Roland G. "Zeno's Game of τάβλη", The Journal of Hellenic Studies 54:2, 1934. pp 202-205.